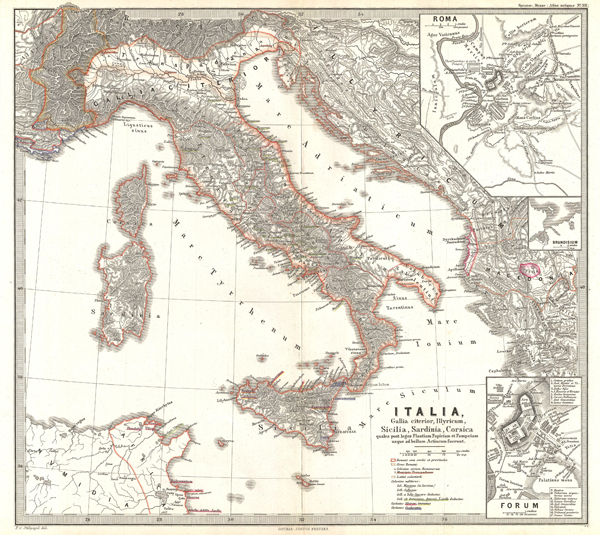 This is Karl von Spruner's 1865 map of Italy, nearer Gaul, Illyria, Sicily, Sardinia, Corsica after the Battle of Actium. This detailed map shows the whole of Italy, Sicily, Corsica, and Sardinia. Spruner also includes three detailed insets. In the top right quadrant depicts Rome, with military camps and buildings labeled. Directly below that is the city of Brindisi. Historically, this was an extremely important harbor city, due to its position on the Italian peninsula and its natural port on the Adriatic Sea. The inset in bottom right quadrant shows the Forum with all major buildings and structures labeled. Map shows important cities, rivers, mountain ranges and other minor topographical detail. Countries and territories are designated with colored borders and each map includes a key or legend. The whole is rendered in finely engraved detail exhibiting throughout the fine craftsmanship of the Perthes firm. Rumsey 1626.012. Phillips (atlases) 3288. Espenhorst, J., Petermann's Planet, p. 397-404. Espenhorst, J., Andree, Stieler, Meyer & Co., p. 148.